Posted by Malene Charlotte Larsen in Aalborg University, Academic, PhD. I am happy to announce that I now have a PhD 😀 Friday was the day of my PhD defence and it was a really good experience. Especially, I want to thank the assessment committee, Mikael Vetner, Elza Dunkels and Leena Kuure, for creating a nice atmosphere with relevant questions and a good academic discussion. Thanks to everyone who helped celebrate me (colleagues, students, friends and family) – I had an amazing day. The entire defence was videotaped and will be available at Aalborg University’s web page at some point. I will add a link when it’s online! For the time being, I will focus on my next big project – the birth of my future daughter (I am 38 weeks pregnant). This also means that I am now officially on maternity leave and will probably not be bogging that much. Thanks to all the readers of My PhD Blog who have followed my academic efforts the past 3,5 years. It’s official! My PhD dissertation has been accepted for defence. The defence will take place next Friday, September 17, at Aalborg University from 9-12. During the defence I will be giving a 45 minute presentation of my work where after each member of the assessment committee will have 30 minutes to ask me questions. 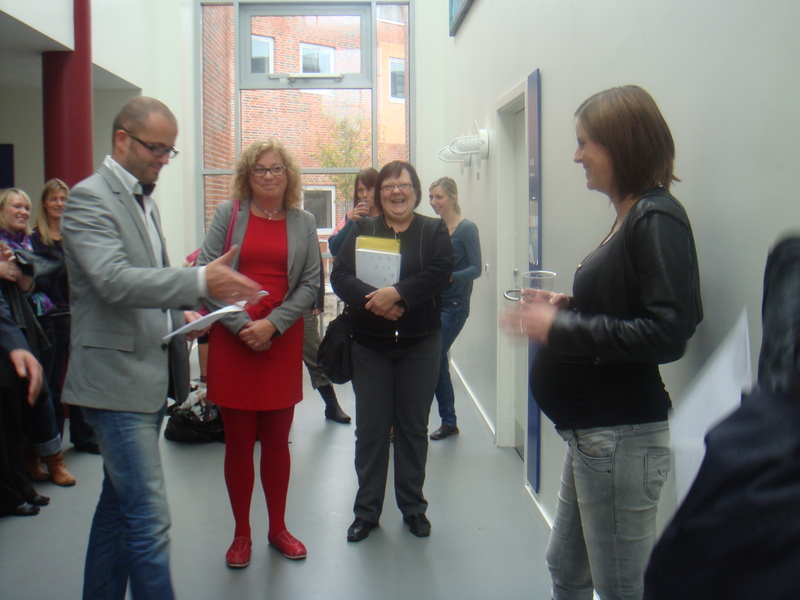 After the defence the Department of Communication will host a reception. Read more about the defence here (in Danish) and sign up for the event on Facebook. 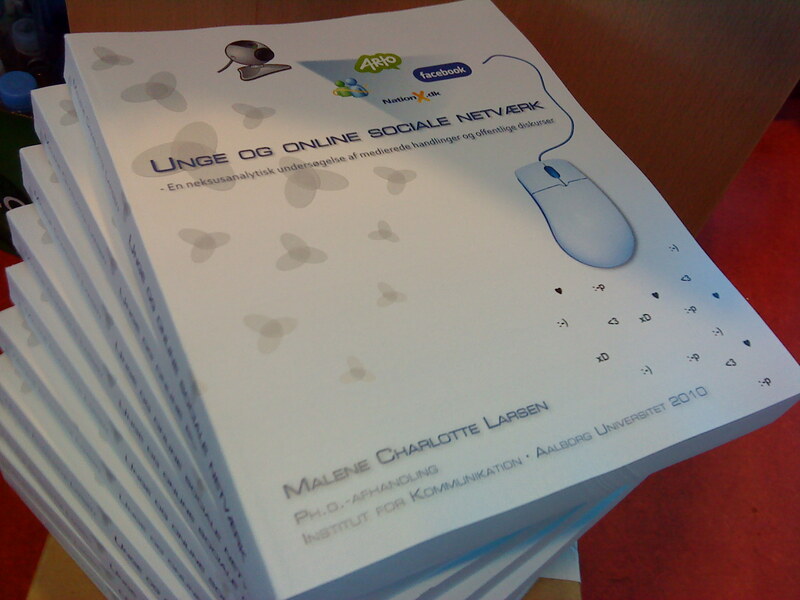 Download the full dissertation here (in Danish). Posted by Malene Charlotte Larsen in Academic, Dissertation, PhD. After 3,5 years of PhD studies I have finally submitted my thesis to The Faculty of Humanities at Aalborg University. The thesis is entitled “Youth and Online Social Networking: A Nexus Analytic Study of Mediated Actions and Public Discourses” and is 388 pages long. 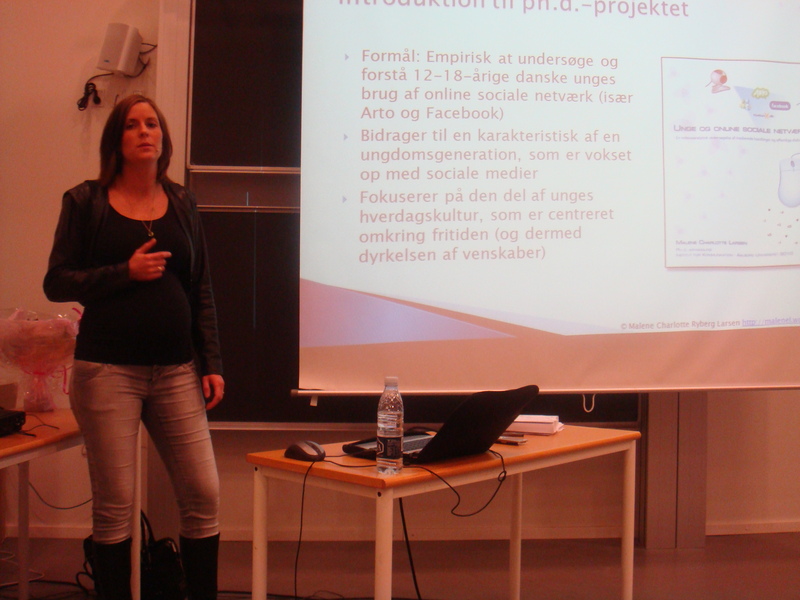 The present PhD thesis investigates Danish children and young people’s use of a relatively recent web-phenomenon: Online social networking. The so-called social network sites (SNSs) are internet based social spaces where users via personalised profiles can list each other as friends and communicate and socialise across time and space. The main purpose of the thesis is to gain an understanding of the meanings SNSs, such as Arto and Facebook, have for young people’s individual and social lives and how they use them as part of everyday life. In order to investigate this, the thesis takes its analytic departure in an extensive amount of various empirical data. The primary data consist of five years of ethnographic engagement (including participatory observation within the field) and a large-scale qualitative questionnaire aimed at investigating the experiences that 12-18 years old Danes have on social network sites. In this way, the thesis encompasses both the level of social actors and the level of discourse. It explores and analyses the central actions young people carry out across social network sites, as well as the ways in which they discursively construct and articulate their concrete use and experiences. Posted by Malene Charlotte Larsen in Dissertation, PhD, Twitter. At the moment I have less than a month left before I absolutely have to turn in my PhD dissertation. On Twitter I am using the hashtag #phd to communicate my ups and downs – and it is comforting to know that there are other people out there in the same position. So if you are a PhD student on Twitter I recommend that you use #PhD in your dissertation related tweets. Note to self! #PhD RT @TDDissertation #Dissertation Writing Tip # 20: You made it this far for a reason. Have confidence in your writing! Posted by Malene Charlotte Larsen in Academic, PhD, Talks. At the Department of Communication here at Aalborg University we have a doctoral program in Human Centered Communication and Informatics (HCCI) which each Wednesday hosts informal lunch seminars where PhD students can discuss ongoing research, present paper or dissertation drafts etc. Today me and guest from Aarhus School of Business, Annette Agerdal-Hjermind, each gave a presentation under the headline ‘Making a Mess with Situational Analysis’. Annette and I are both using Situational Analysis (Clarke, 2005) in our PhD projects and we wanted to exchange experiences and receive feedback from colleagues. Annette is working with blogging in an organisational context and gave an interesting presentation on her case, data and how she is planning to use Clarke’s situational maps when coding, mapping and categorising her data. You can learn more from her PhD blog. The situational maps are exactly the parts of Clarke’s framework I have integrated in my PhD project. Here, I am using Scollon & Scollon’s (2004) Nexus Analysis as a methodological and theoretical framework. As a first step in a Nexus Analysis the Scollons suggest that you make broad-stroke maps of your field and the many discourse cycles that are circulating through the moment of social action you are studying. I think Clarke’s maps are useful tools when engaging in such a task, since the point is to map out “the complex situations of inquiry broadly conceived” (Clarke & Friese, 2007, p. 366). Both Clarke and the Scollons believe that ‘context’ should be understood and treated as something that exists within the siuation of inquiry (and not as mere background). Therefore, I think the two frameworks go well together and the combination has worked for me when trying to sketch out maps of young people’s use of social network sites in Denmark. Posted by Malene Charlotte Larsen in Blog, PhD. Today it’s been three years since I started ‘My PhD Blog’ and wrote my very first post. Wow, time indeed does fly when you’re a PhD student. Given that the blog is now three years old, I should have handed in my dissertation by now – actually, my PhD scholarship officially expires today(!). Luckily, my university has been kind enough to grant me with a couple more months to finish it. My New Year’s resolution for 2010 is therefore to spend as much time in my office as possible and be able to hand in the dissertation sometime around March. If that happens it looks like there is a position as an assistant professor waiting for me – and with that a lot of teaching, which I look forward to. I also look forward to having the time to blog in grater detail about my research findings. Happy New Year to all readers and commentators of this blog. I wish you all the best in 2010! Posted by Malene Charlotte Larsen in Dissertation, PhD, Procrastination. I have three months left before I have to turn in my PhD, which of course means that all I am doing at the moment is writing and working on my dissertation. Being in this state of mind has made me think about all the different metaphors one could use to describe what this last phase of the PhD process is like. I think for me – at least at the moment – writing a PhD thesis is like completing a jigsaw puzzle. Sometimes you have only four pieces and other times 4000 pieces to fit together. Another, and not necessarily optimistic, metaphor could be viewing the process as a train ride. Normally it goes fast, sometimes there are delays – and you just hope it doesn’t crash! What is the PhD process like for you? Can you come up with other eloquent metaphors? Posted by Malene Charlotte Larsen in Academic, PhD, Twitter. I have nine months left of my PhD scholarship, which means nine months to finish the nine chapters, that my dissertation is composed of. As anyone who has ever tried it can probably testify, writing a 300 pages dissertation is a bumpy ride with many ups and downs. Btw, I feel sorry for not being so active when it comes to blogging – but now you know why. Posted by Malene Charlotte Larsen in Academic, PhD. Together with PhD student Stine Lomborg from the University of Aarhus I am currently planning a PhD course about social media to be held in Denmark next year (24th to 26th of June 2009). The course is entitled “Social Media: Analysing Identity, Sociality and Creativity in Online Networked Environments” and is open to PhD students who do research into the uses of new social media in everyday life. The general aim of the course is to address new social media as means of self-creation, peer-to-peer production and social networking. The more particular aims are 1) to discuss conceptual and theoretical tools to analyse the intersections of identity formation, community building and content creation in online networked environments 2) to strengthen the participants’ analytical skills when dealing with complex and multimodal empirical data 3) to enhance analytical reflexivity when studying the everyday uses of social media. The course will be funded and sponsored by The Danish National Research School for Media, Communication, and Journalism (FMKJ) and The Post Graduate Research School of Human Centered Communication and Informatics (HCCI) at Aalborg University. Read more about the course here. So far, we have a number of interesting international scholars who will present their research and give feedback to PhD students during the course. At the moment Nancy Baym, Associate Professor of Communication Studies at University of Kansas, José van Dijck, Professor at Universiteit van Amsterdam, Anne Scott Sørensen, Associate Professor at University of Southern Denmark, and Marika Lüders, Researcher at SINTEF, have confirmed their participation.